It’s getting HOT in the smart watch arena. 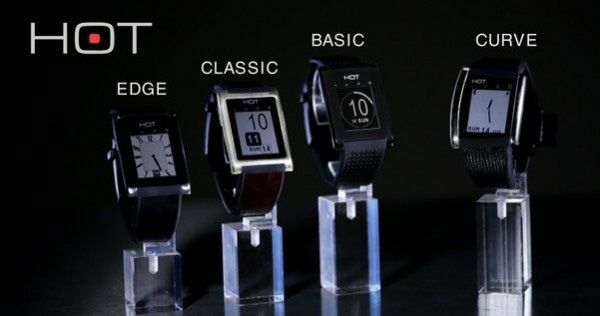 A new Kickstarter project takes aim at some of the current big players in the smart watch scene and some of the possibly bigger ones to come with an innovative approach which actually allows you to use the watch for conducting private phone calls as well as sending SMS massages, e-mails etc. Pebble, Cookoo, Sony’s Smartwatch not to mention the much anticipated Apple iWatch and possibly competing Google and Samsung products, there seem to be more and more smart watch options on the market and things are just getting started. So what can a new Kickstarter project bring to the table that all these big names can’t? The answer is a new way to make phone calls without taking your mobile phone or of your pocket (or bag). Here is how it works – the Hands On Talk (HOT) Smartwatch uses a patent pending technology which bounces sound waves from the watch built in speaker off of your cupped hand place near your ear (see illustration below and the project kickstarter video). As with other Smartwatches the HOT pairs with your handset over Bluetooth connection and using a special app (available for both Android and iOS you can control different aspects of the Smartwatch. A secondary DSP processor for Bluetooth, Call control and Audio Enhancements. 1.26-inch e-paper capacitive multi-touch Anti-reflective glass display. Bluetooth 4.0 (Bluetooth Dual Mode). Built in Led Flash light. Private calls using the palm of your hand. Voice activated calling (based on SIRI or other smartphone based voice systems). Music player remote control (controlling your mobile phone’s player). Receive and reply to Messages including SMS, Email as well as Facebook and Twitter. Fall detection with automatic text to emergency number. Option to find your phone with remote beep from your mobile phone. You can secure yourself a HOT Smartwatch on Kickstarter over the next 32 days with a pledge of $119 over on kickstater (the project already raised almost $300,000 – about twice its asking amount). There are currently 4 designs available (EDGE, CLASSIC, BASIC and CURVE) and more should be available later on.